‘Not another special Sunday! Who dreamed this one up?’ For a good many years now more and more parishes have kept the Sunday before or after the Feast of St Francis of Assisi (October 4) as a day of thanksgiving for the animal creation and of penitence for many ways in which animals have been abused by humankind. 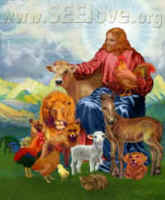 Recently this has been formalised in England by an ecumenical initiative on the part of three organisations: Catholic Concern for Animals, the Anglican Society for the Welfare of Animals and Quaker Concern for Animals – three groups who work together to win for animals their proper place on the agenda of the Christian Churches. Though here have always been individual Christians who cared deeply for animals, and worked for their welfare and protection, it is sadly true that animals have never had an official and recognised place in the prayers and teaching of the Christian churches. Yet surely this is to ignore a major theme in Scripture. To begin with, though Scripture recognises the unique character capacities of human beings, it also places us (as does science) in whole panorama of living, fleshly beings who owe their life to the creative love of God (Genesis 1: Psalm 104). It makes no difference if we all came to be through some process we call evolution. God is the ultimate Source of Being and Life for all of us, and – very important this – the other animals are not here, as we like to think, simply for our benefit. God treasures them all for their own sake (Job 38-41). But because of what we are we have responsibilities to our fellow animals. Our brains give us power over them, but God meant that power to be used in peaceful co-existence. It is our sinful misuse of freedom which leads us to exploit and tyrannise over them instead of co-operating with God’s covenant of love for the earth (Genesis 9.1-17); but the Bible also speaks of a duty of care and a mutual affection (eg, Exodus 23:5; Deuteronomy 22:6-7; 25.4; 2 Samuel 12:3; Proverbs 12:10). In the Gospels Jesus draws on examples of our care for animals to teach about God: the shepherd who searches for the one lost sheep out of a hundred; the owner who puts the rescue of a trapped beast above the religious observance of the Sabbath. In predicting the replacement of the Jerusalem Temple by spiritual worship he implies an end to animal sacrifice. He sums up the whole meaning of his life and work in the image of the Good Shepherd who gives his life for the sheep. We are surely meant to bring the spirit of sacrificial love to our own world and everything in it. Christ as the true ‘image of God’ is the pattern for our living, and the means that the power our intelligence gives us has to be used in his Spirit in everything we do – and that includes our dealings with other animals. The key factor for our treatment of animals is their ‘sentience’, their ability to feel physical and emotional pleasure and pain. This covers not only particular incidents of cruelty or kindness but the question of general well-being: do the conditions in which they are kept provide mental stimulation and scope to express their natural behaviour patterns? This may call for long and patient observation. But most instances of animal abuse are glaringly obvious. Take the food industry. The millions of broiler fowl, crowded together many thousand to a shed, standing in filthy litter, or turkeys, fed to grow so fast that their legs break. The scandal of live animal transport, where event the inadequate regulations for breaks in their journeys across Europe, or for feeding and watering outside the trucks, are routinely disregarded. The horrors of slaughtering, with animals terrified by the smell of death, or poultry going into the scalding tanks while still alive. Then there is the question of animals used in scientific experiment, which is the theme suggested for this year’s Animal Welfare Sunday. This is usually seen as a choice between animals and humans: which is more important, sparing animals pain or finding cures for disease? But this is a gross over-simplification. Of the 2.7 million animals used yearly in scientific procedures in this country, many suffer simply for routine testing of existing products, others are genetically manipulated simply ‘to find out what happens’. Many tests could be carried out with non-animal procedures but that would mean expensive research, and animals are cheaper. Where the objective is to cure illness, doctors have voiced serious doubts about applying to humans some animal test results. These are but two examples in a huge field, but whether we are talking about cruel sports or mistreatment of working animals, or neglect of pets, or endless other cases of animal abuse, the basic issue is the same: cruelty, and cruelty inflicted for our own human advantage. If that is not matter for concern for Christians who profess to believe in a divine Creator and a primary law of love, what is? Is it too much to ask that on one Sunday in the year we should open our hearts and mind to the outrages we commit on God’s other animals?